OUTER BANKS, N.C.– Not everyone vacationing on the Outer Banks takes to the water (all the time). On those few days when it rains, or when visitors want a break from the beach, they’ve got plenty to keep them busy inland. 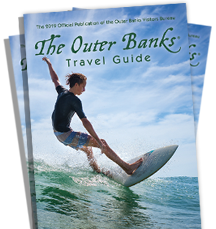 In addition to its broad range of historical and cultural attractions and the wide-open spaces of its many parks and natural sites, the Outer Banks offers visitors myriad other recreational options. They can explore the area on foot, by bicycle or on horseback. They can hit a round of golf, play a game of tennis, watch the kids race go-carts, go gallery hopping or shop ‘til they drop – all without traveling beyond the barrier islands of the Outer Banks. Many choose to take the path less traveled and explore beaches and maritime forests on foot, where they discover hidden treasures in places like Buxton Woods and Nags Head Woods Preserve. Hiking trails also are offered at Jockey’s Ridge State Park, Alligator River Wildlife Refuge and at Pea Island National Wildlife Refuge. To help preserve the area’s remote wilderness, hiking on restricted dunes is prohibited. Others would rather wheel their way through the destination, which features several bicycle paths and wide paved shoulders on most major roadways. Wheeled explorers will find biking opportunities in Sanderling, Duck, Southern Shores, Kitty Hawk, Kill Devil Hills, Nags Head and Roanoke Island. For family riding, especially with children, bike paths are available in most of the towns for slower paced touring or for a relaxing afternoon ride. These are paved separate routes that wind along parallel to the highway or through wooded areas. Some of them connect riders from town to town without them having to brave the motor vehicle traffic. For faster riders, there are many wide outside lanes and wide-paved shoulders to provide separation between cyclists and motor vehicle traffic. The Wright Brothers Bikeway stretches from beyond the north end of the Outer Banks in Sanderling to South Nags Head. It consists of a combination of wide-paved shoulders, bike paths, and quiet neighborhood streets. In all cases, the bike paths are shared with pedestrians. There is one short section in Kitty Hawk that is not completed. Those who wish to explore the entire length of the Outer Banks can ride 130 miles from Corolla and Duck at the north end to Cape Hatteras and Ocracoke at the south end, with a relaxing 40-minute free ferry ride between Hatteras Village and Ocracoke to rest their legs. Bikers are encouraged to visit the Outer Banks Visitors Bureau web site at www.outerbanks.org for information on routes and a link to the Wheels of Dare Bicycle Club, which outlines biking opportunities in detail and includes an overview of North Carolina bicycling laws and guides for beach area riding. If riding horses rather than bicycles appeals to vacationers, they can enjoy scenic trail rides through Buxton Woods and peaceful, memorable rides along uncrowded beaches. Equine Adventures (252- 995-4897) in Buxton has details of the rides. Reservations are required. Gentle ocean breezes whisper an invitation to golfers to play on some of the finest year-round courses in North Carolina. The Outer Banks offers myriad courses certain to challenge both experienced and beginner players. There are four public courses on the Outer Banks as well as additional courses in the surrounding region. Golfers at Duck Woods Country Club (252-261-2609) enjoy a semi-private 18-hole, par-72, Ellis Maples designed course that’s routed through an array of canals and majestic greenery. The championship course is both visually stunning and supremely challenging. The course and grill are open year-round at milepost 1 on the U.S. 158 Bypass in Southern Shores. Just a short drive down the road at Nags Head Golf Links (252-441-8073), players are treated to an 18-hole Scottish-style championship course, where Bentgrass greens and Bermuda fairways complement the landscape and remain in good playing condition year-round. The clubhouse features the Links Grille restaurant and bar as well as a golf shop. This course, which offers great views of the Roanoke Sound, also is open year-round at milepost 15 on the U.S 158 Bypass in Nags Head. Nags Head Golf Links is the perfect location for Outer Banks golfing. Keeping with the true Scottish links tradition, world-class architect Bob Moore blended the Outer Banks natural windswept environment into a shot maker’s paradise. Coastal winds add to the challenge, prompting Golf Digest to call the Nags Head golf links “the longest 6,126 yards you’ll ever play.” Golf Digest went on to say the holes along the Roanoke Sound are “among the most beautiful in the Eastern U.S.” The view makes it a favorite for those looking to golf Nags Head. Get your swing at the Sea Scape Golf Links (252-261-2158), an 18-hole championship course that winds around the edge of the Kitty Hawk Maritime Forest and provides beautiful views of the sea. Designed by former PGA tour player and Masters Champion Art Wall, the course also features a pro shop and restaurant. Tennis lovers on the Outer Banks will find a private club as well as free public courts where they can enjoy a singles or doubles match. Duck Woods Country Club (252-261-6438) in Southern Shores is the private club that offers four clay courts. For public use, there are two-hard surface courts near the Kill Devil Hills Fire Department, and four hard-surface courts beside the Kill Devil Hills Water Plant. In Nags Head, there&apos;s a public court located behind Kelly&apos;s Restaurant off the US 158 Bypass at milepost 10.5. On Hatteras Island, courts are available in Buxton at the Cape Hatteras School. The courts located at area schools are open to the public but only during after-school hours. While some vacationers are hiking, biking, horseback riding and playing golf and tennis, others are having fun at the destination’s recreational amusements. There’s the Promenade (252-261-4900) in Kitty Hawk, with its children’s park, driving range, grass-putting area, water sports options, mini-golf course and arcades that are open year-round. And then there’s Colington Speedway (252-480-9144) also in Kill Devil Hills, with its three tracks for two-seater and kiddie Naskarts. They are just a few of the destination’s options for miniature golf, go karts and other family entertainment. Besides shopping for local artisans’ work, Outer Banks visitors will find other treasures in the destination’s nine shopping malls, including the Tanger Outlet Center in Nags Head (252-441-5634) offering savings on designer brands, and Scarborough Faire in Duck featuring specialty shops and services.